According to German law, waste must be treated and reused, whenever this is feasible and reasonable. Infrastructure waste, such as road sweepings, slurries from sewer or storm tank flushing, gully waste and grit chamber slurries, contain predominantly sand and grit, but also some debris (e.g. packing and wrapping materials), coarse solids (e.g. stones, wood, glass and metal parts), and organic matter (e.g. soil, leaves, grass, kernels, fruit stones). 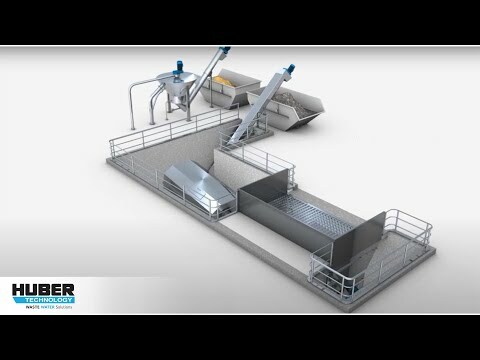 We provide efficient HUBER technology for the treatment of grit containing waste. We remove, wash and compact debris and other coarse solids; they are disposed of or incinerated as municipal solid waste. We produce a washed and dewatered sand and grit fraction that contains very few volatile solids (< 3 %) and water (< 10 %) and is thus reusable as construction material, e.g. for road and pipeline bedding. We also produce an organic fraction that is reusable as soil material, e.g. for landscaping and land reclamation. We also treat and recycle wash water as process water. Our systems are very economical because they produce valuable and reusable materials and minimize the amount of waste for disposal. Among our customers are not only operators of municipal wastewater treatment plants, but also waste management companies. 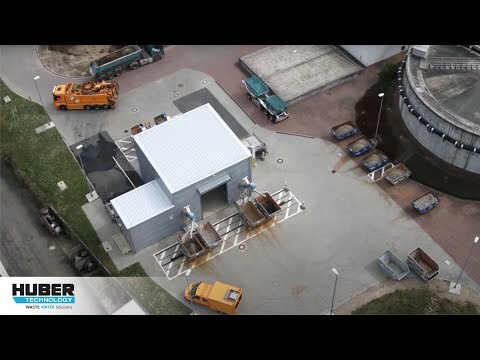 A HUBER Reception Bunker serves for raw waste storage. A conveyor screw is integrated in the bunker and serves for controlled waste feeding. In our Wash Drum the fed waste is submerged and homogenized. Coarse solids (> 10 mm) are screened out and washed, while fine solids (< 10 mm) are suspended in the wash water and drained through the drum. Washed coarse solids are discharged at the drum’s end and dewatered and compressed in our Coarse Solids Compactor. The drained suspension is pumped to a HUBER COANDA Grit Washer. In its fluidized bed mineral solids are separated due to their high specific weight. The mineral fraction is intensively washed and then dewatered (volatiles < 3 % and water < 10 %). Coarse grit can be screened out and recycled as road grit. Organic solids (> 1 mm) are removed from the remaining suspension with a HUBER wege wire Rotary Drum Fine Screen. They are simultaneously dewatered and compacted (> 30 %DS). The screened water is re-circulated as wash water to our Wash Drum. Surplus can be treated in a HUBER Longitudinal Grit Trap for removal of very fine sand (< 0.2 mm) and, after flocculation, in a sedimentation tank and a HUBER Dissolved Air Flotation Plant (DAF) for removal of colloids. 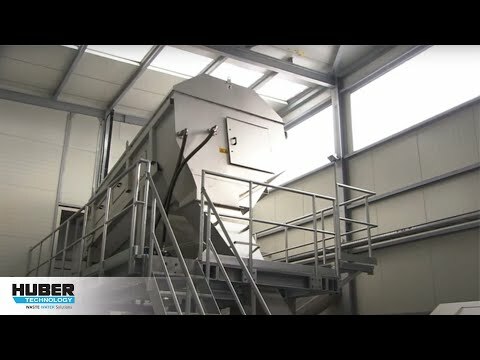 The DAF’s effluent is recycled as process water to the Grit Washer and Wedge Wire Screen. Removed sludge is dewatered in our Screw Press; solids contents of over 50 %DS can be achieved. If the system is located at a sewage treatment plant, the organic suspension is generally discharged into its headworks and the plant’s effluent is reused as process water. Special process water treatment is then not needed. When we implement our solutions, we also provide other top-quality stainless steel components, such as Screw Conveyors and Manhole Covers. 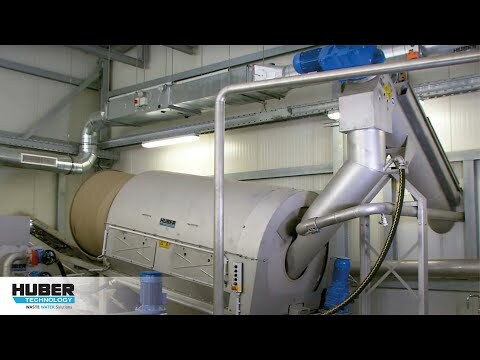 Separate the wheat from the chaff: What should a good grit washer be able to do?